Lost In Translation is a great game that allows you to highlight the importance of communication. Lost in Translation is a simple game that requires a few items, but very little to no set up. 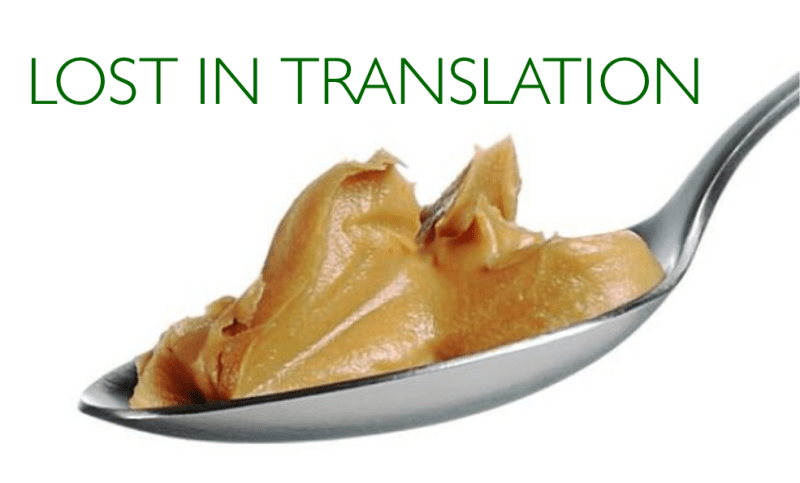 The game centers around one’s ability to communicate… with a spoonful of peanut butter in their mouth! Once the teams are split into two, they will need to select someone to be the speaker. This is the person who will come to the front of the group and read a phrase until their team can guess it correctly. The only catch is that they must first put a large spoonful of peanut butter in their mouth. When the peanut butter is in their mouth, have them close their mouth, but not swallow (just for a second) and then read their phrase out loud. 1. High roller, low roller, lower roller. 2. I need a box of biscuits, a box of mixed biscuits & a biscuit mixer. 3. The jollie collie swallowed a lollipop. 4. Friday’s five fresh fish specials. 5. Three free hugs set three thugs free. 6. Lot lost his hot chocolate at the loft. 7. Girl gargoyle, guy gargoyle. 9. Six sick slick slim sycamore trees. 10. A one-half inch insulin syringe. The goal of each speaker is to get someone from their team to say the exact phrase they are saying. Trust me, much will be lost in translation, but it’s not impossible to get the phrase after some time. Once the phrase is guessed, the team is awarded a point and another person from the team becomes the speaker (each person can only speak once, unless teams are small). The first team to 7 wins! 2. Hand the spoonfuls of Peanut butter to contestants so that they are even. 3. If you have someone with nut allergies, make sure they stay away from the peanut butter or anyone who is touching it. It’s a good idea to have some bottles of water and wet wipes to make sure the speakers can speak and be clean after they go for their round. 4. Use the game to teach about the importance of direct and clear communication. What are some of the “sticky” points of communication that keep our message from being understood? 5. Have a couple leaders listening for the correct phrases. It will be difficult to hear if you have a large group playing. 6. Award a large jar of peanut butter (from Costco or Sam’s) to the winning team. Take their picture and put it on Facebook & Instagram (make sure to tag them as well! ).